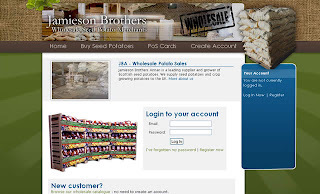 Jamieson Brothers now have a merchant website for wholesale supplies of Scottish seed potatoes. This is database driven with use of php and asp scripts to control content display and user account features, and was developed in partnership with the prodigious Kit Allen. This runs in conjunction with the "JBA Direct" website that is geared towards selling seed potatoes to domestic customers in the UK. The wholesale site has been built specially for garden centres, allotment societies and other seed potato merchants so that they can benefit from trade prices when they buy seed potatoes in bulk quantities.